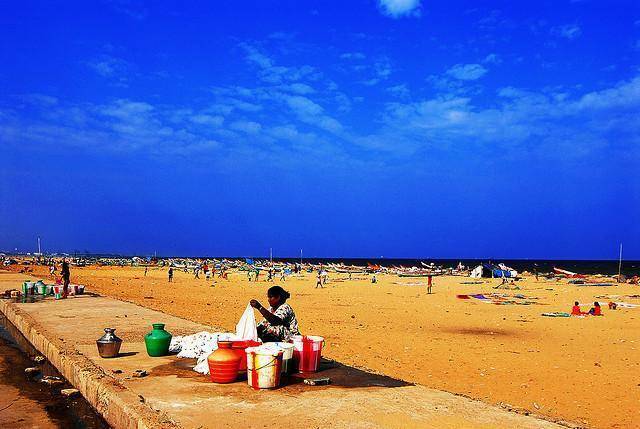 Being the second largest beach in the world, Marina Beach is the most famous sightseeing in Chennai. It stretches along 13 km right from St.George Fort till Mahabalipuram. In 1800, British Governor Mountstuart Elphinstone Grand Duff took lot of initiative to make this spot as an interesting tourist spot. The view of dusk and dawn will sure rejuvenates the watchers. In the morning tourists can see many local people doing Yoga, Walking and Meditation on the golden sands of Marina Beach. In the evening many local people, tourists, students and kids swarm the beach. Horse riding is available for adventure lovers. Swimming and bathing in sea is not allowed as the current is under much turbulent in this beach. Around the beach tourists can visit many famous monuments, memorials of Tamilnadu Political Leaders, Statues of Tamil Scholars etc which are all falls within walkable distance. Being one of the longest beach in the world, is ideal spot for joggers. The beach isn't particularly well maintained and can be avoided on weekends when large crowd converge here and parking is hard to find.